Metal credit cards in Singapore range from ‘by invite only’ cards with incredibly high fees to more affordable options, that allow consumers to apply directly. Below, we’ve reviewed the best metal credit cards in Singapore, with details on both types. OCBC Voyage Card is not only an exceptional metal card in terms of value-to-consumer, it’s also more accessible than any of its alternatives. Cardholders can apply directly, instead of waiting for an invitation, and need a salary of ‘just’ S$120,000 to qualify (compared to S$500,000+ with others). In addition, the annual fee is S$488.0–the absolute lowest of metal cards on the market. Nonetheless, OCBC Voyage Card comes with excellent benefits. In fact, cardholders earn 1.2 miles per S$1 locally, a boosted 1.6 miles for local dining, and 2.3 miles overseas–rates that are higher than offered by even some of the most expensive metal cards. Cardholders also enjoy flexible miles redemption as there are no black-out dates, no conversion fees, and minimal processing time. UOB Lady’s Solitaire Metal Card is one of the more accessible metal credit cards and offers higher miles-earning rates than alternatives. Cardholders earn 4 miles per S$1 spend in 2 categories of their choice, which can be updated or changed every quarter: travel, dining, beauty, family, fashion, transport & entertainment–both locally and overseas. To put this in perspective, most metal cards offer 2 miles per S$1 spend, at most. However, earnings with UOB Lady’s Solitaire Metal Card are capped at 10,800 miles/month, which means consumers spending more than S$3,000/month are losing out on their earning potential. As a result, UOB Lady’s Solitaire Metal Card is best for above-average spenders. While there’s a S$588.0 fee, it’s fairly low compared to other metal cards. In addition, cardholders who max out their miles every month can still earn S$708 even after the fee is deducted. In addition, while UOB Lady’s Solitaire Metal Card is a more ‘affordable’ option, cardholders still enjoy 2 free lounge visits & 2 free airport transfers/year, free travel insurance, unlimited Boingo WiFi access, and 1-year free Global Hotel Alliance Black Loyalty Membership. Overall, if you want a metal card to maximise miles and spend about S$3,000/month, this could be the card for you–while marketed as ‘by invitation only,’ you can earn an invite by spending S$45,000 on an existing UOB Lady’s Card. UOB Visa Infinite Metal Card is by far the best metal card for luxury privileges that consumers can apply for directly, rather than waiting (and hoping) for an invitation. Cardholders earn at a fairly standard rate of 1.4 miles per S$1 locally and 2 miles overseas, and receive 25,000 bonus miles (worth S$250) with every payment of the S$642.0 annual fee. While this fee is admittedly high, it’s still lower than that of many other metal cards’. In addition, it’s reflected in the many perks offered to cardholders. For example, cardholders receive 4 free lounge visits/year (plus access to UOB Infinite Private Lounges in SE Asia), free travel insurance, Hertz rental car discounts and upgrades, room upgrades via Visa Luxury Hotel Collection, Tower Club Singapore and China Club Singapore access, and golfing privileges across SE Asia. While these are great perks, they’re not especially unique amongst metal cards–what makes UOB Visa Infinite special is it’s excellent concierge and support services. Cardholders benefit from UOB Travel Concierge, which offers complimentary flight upgrades, boosted miles rates, and even free transfers with select travel packages. They also receive access to UOB Medical Concierge, which helps to fast track appointment scheduling, make hospital admission arrangements, and even to find proper medical specialists. Finally, cardholders enjoy home, vehicle, travel and medical assistance, up to S$50,000/year. This includes everything from electrical repairs to vehicle towing. Overall, UOB Visa Infinite Metal Card’s support services are some of the best on the market for everyday assistance–reaching beyond instances of luxury. In addition, you can apply directly, and pay a lower fee than with other metal cards. If you want to enjoy elite privileges now, rather than waiting for an invitation, this could be a great option for you. Citi Ultima Card is the best ‘by invite only’ metal card for travellers who love to golf. Cardholders earn 1.6 miles per S$1 locally, 2 miles overseas, and receive 150,000 bonus miles (worth S$1,500) with each card renewal–which, while substantial, only partially offsets the S$4,160 annual fee. Cardholders must earn S$500,000/year to even qualify, so this card is truly limited to the very affluent. In terms of perks, cardholders receive quite a variety. Principal cardmembers and up to 2 supplementary cardholders receive unlimited lounge access via Priority Pass (though guests are not included), and cardholders receive free meet & greet services and airport transfers with purchase of 1st class or business class air tickets. Cardholders also receive fast-tracked immigration to maximise airport convenience. And, while travelling, cardholders enjoy a free hotel night with every booking within the Visa Luxury Collection. Additional perks include dining privileges and discounts at top restaurants in Singapore, complimentary Club 21 styling services, and even discounted yacht charters. Citi Ultima Card stands out, however, for its golfing privileges. Cardholders + 1 companion receive unlimited free green fees across 21 courses in SE Asia, plus an additional 3 session for the principal member across a wider span of 280 fairways worldwide. No other card parallels Citi Ultima Card’s golfing perks. Overall, this metal card is best for avid golfers who also want top-notch travel privileges. The American Express Centurion Card is extremely exclusive–in fact, it’s difficult to find many details about this ‘original’ metal card online. Consumers must be invited to apply, and those that do will be expected to pay both a S$7,490 joining fee plus a S$7,490 annual fee–that’s an incredible S$15,000 payment upfront. Those seeking top-of-the-line luxury, however, may very well feel this expense is worth it. This card isn’t really about earning miles–general spend earns a very low 0.87 miles per S$1, though it’s worth pointing out that spend with select luxury brands earns 7.12 miles per S$1. What does make Amex Centurion stand out is the sheer amount of perks it offers. Cardholders instantly receive elevated hotel statuses across the board: SPG Gold, IHG Platinum, Club Carlson Gold Elite, Hilton Diamond, and Shangri-La Golden Circle Diamond. They enjoy special treatment spanning from early check-in and room upgrades to $100 USD in amenity credits. Cardholders also receive unlimited lounge access for themselves and 2 guests, with free travel insurance, meet & greet services, and even S$800 credit towards a private jet charter. Amex Centurion also provides cardholders with exclusive restaurant reservations at Singapore’s top restaurants, access to a personal shopper and private shopping, and of course, Tower Club Membership. As if that weren’t enough, cardholders also receive 40% off yacht charters and up to S$500 credit with select cruise lines. All of this considered, it’s a bit easier to understand how Amex Centurion Card commands such a high fee. And, if you do receive an invite, you’ll be one of the few–the number of cardholders in Singapore is capped. American Express Platinum Reserve Card is one of the more affordable metal cards and unlike competitors, who offer primarily travel-oriented perks, it provides some of the best benefits for luxury within Singapore. Cardholders earn at notably low miles rates–0.69 miles per S$1 general spend and 3.7 miles with select merchants–but Amex Express Platinum Reserve derives nearly all of its value from perks and privileges. In fact, just by signing up you’ll receive a free 3 day 2 night stay at participating Frasers Hospitality properties worldwide, as well as 50,000 points (27,778 miles) after just S$5,000 spend. Cardholders also enjoy excellent local perks, including access to top dining and nightlife establishments within Singapore. This includes access to the Tower Club Singapore (worth S$1,450/year) as well as a complimentary Far Card Classic Membership (worth S$425). Other privileges include golfing privileges throughout SE Asia and access to a full suite of Amex benefits, including American Express dining privileges. Overall, these benefits more than make up for the S$535 annual fee, which is already much lower than competitor cards–it’s an ideal option for local high spenders seeking luxury. DBS Insignia Visa Infinite Card is an excellent metal card for Hyatt Hotel loyalists and boasts one of the better rewards rates amongst it competitors. Cardholders earn 1.6 miles per S$1 locally and 2 miles overseas, with an added 100,000 miles bonus (worth S$1,000) wherein miles are non-expiring. Card perks are quite impressive too, including a free 2 night stay for the principal cardholder at exclusive hotels worldwide, free lounge access via Priority Pass, and expedited immigration service. DBS Insignia Visa Infinite Card stands out for its partnership with Hyatt Hotels. Cardholders receive a Club Hyatt Membership worth S$298, which also comes with discounts up to 50% off dining bills at restaurants in Grand Hyatt Singapore. Cardholders also have access to Damai Spa at Hyatt, which includes free use of the pool, gym, tennis courts, and other amenities. Finally, this card has a few upscale touches that provide convenience and personalized appeal. DBS Insignia Visa Infinite Card is the first all-metal credit card that offers contactless pay. In addition, cardholders have their name etched in cursive onto the card. This card is definitely not for everyone, however. It’s ‘by invite only,’ requiring a S$500,000+ salary, and has a hefty S$3,210 fee. Overall, affluent Hyatt loyalists may be especially interested in DBS Insignia Visa Infinite Card. Below, we've prepared a summary of our picks for the best metal credit cards in Singapore for 2019. 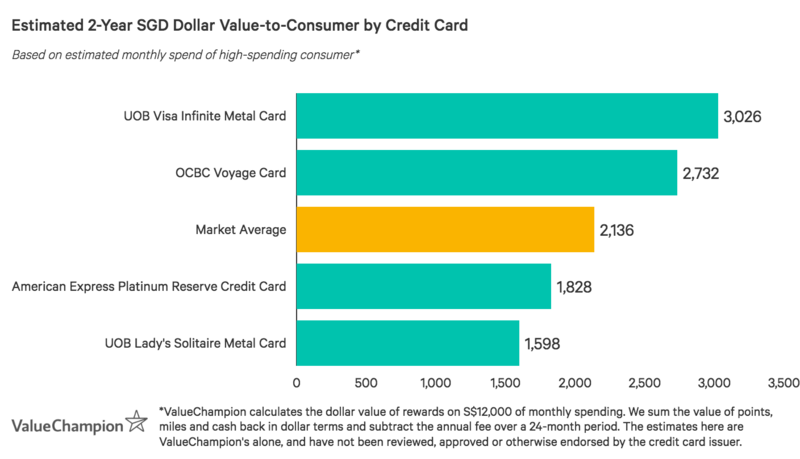 The graph below represents the approximate value-to-consumer (in SGD) of the best metal credit cards in Singapore. Dollar values are calculated based on approximate rewards earned with a S$12,000 monthly spend for 2 years. This number varies, however, depending on individual spending habits.